Good morning friends. I'm so happy to announce today's giveaway! 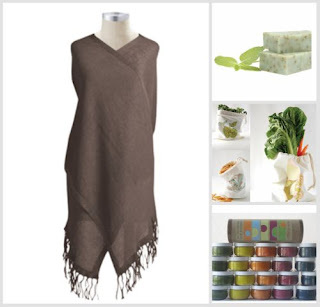 Green Rainbow Shop is a wonderful resource for eco shopping for the holidays and everyday. Green? Check. Organic? Check. Handmade? Check. They carry such a nice variety, that there's bound to be something special for everyone on your list. 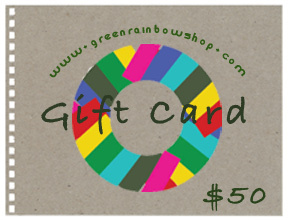 Today they are generously offering a $50 gift card to not one, but TWO lucky readers!!! If you'd like a chance to win please leave a comment in this post by Monday at 9pm EST. I'll announce the random winners on Tuesday morning. Good luck! 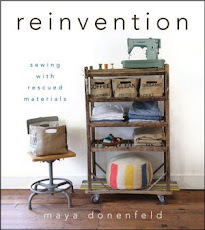 Green Rainbow Shop will also be offering a 15% discount to maya*made readers through 11/30/10. The code is MADE. It looks like a great store, I'm off to browse. Great giveaway! I'm off to check out what the store has to offer. please enter me ! thanks !!! i'd love some of their yummy soaps! Looks like a lovely shop, fingers crossed. eco shopping at green rainbow? Yes please! Some great gift ideas! The gift certificate would be well used. Oh, and the discount for Maya Made readers is also an incentive! What a great shop! I love the kitchen towels and the produce bags. Thanks for the chance! Wow, what a generous giveaway! It would really be a nice start to the holiday shopping madness. Thanks for the chance! What A fantastic shop. I looked in there for gifts and really thought "I want one!" I'm so excited! I've been browsing the store for about an hour now! ohh.. just browsed, and the hardest decision will be to buy for someone else, or for myself! so many great products! and the prices look nice, too. The kids' marching drum shirt is so cute! Thanks for the generous giveaway! Interesting... I'm going to love it, I'm sure. What a neat shop! I especially like the cast iron teapots and the vintage metal signs (laundry!). The kids puzzles are fantastic too! oo neat giveaway! i'm inlove with the teardrop t and the mix tape t. but if i were to win i should use it buy christmas gifts. Lovely store! So many pretty things! Nice store. I can see doing a little xmas shopping there. I love this store. I know a few folks who'd love a gift from here! What a wonderful resource and giveaway. Everything looks like such nice quality - thank you! Wow! Neat. Thanks for sharing another great resource! Thanks for sharing this. I have a new bookmarked store! Happy Day! Really nice selection and I love the name of the store, too. What a great shop! Thank you! I love Green Rainbow Shop. It would be really terrific to use this for a couple holiday gifts. Thanks for the opportunity. What a wonderful discovery! There certainly are some holiday gifts in here! wonderful! looks like a great place to find unique xmas gifts. Great holiday gift ideas. Thanks for the giveaway. Very generous! Lovely items in the shop! wow what an awesome giveaway. 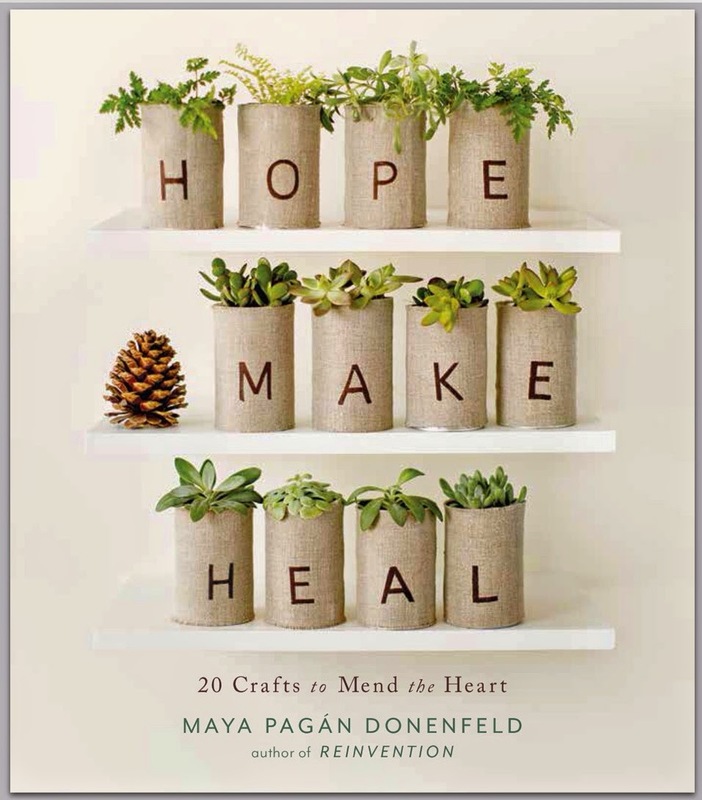 this would be perfect to round out all our handmades for the holidays! as if I don't love you enough, you go and offer this great stuff,w itha discount fo ryour readers! Sweet! What an inspiring store! I love their stuff. Such a great giveaway, especially with the holidays coming up! Oooh, could I buy a Christmas present for myself?! Great giveaway!! I really enjoy your blog. Oh how fantastic.. What a great shop! Many thanks for such a generous giveaway..
What a wonderful store! Thank you for the great giveaway! I had never been to that shop before. Clicked on this morning and found at least a dozen things I would LOVE to use a gift card toward! Thanks for hosting the giveaway. What a fantastic and generous giveaway! So excited for this opportunity! I'd love to be entered as well.. I would buy the Traverse Top for holiday parties if I won!! Thanks for the introduction! I hadn't heard of them ~ looks lovely! What an amazing selection of products. the eco dough and wooden puzzles would be perfect gifts for my niece. I've only had a brief chance to browse.. but wow! So many great items! It's a great shop, glad I found it! Choosing what to buy would take some serious thought, everything is so wonderful! Thank you both for a very generous giveaway! this is such a wonderful giveaway! thanks for the chance!! Lovely! What a great shop! Looks like a lovely shop, thank you. just where I'd like to do my christmas shopping! oooooh! lots of lovely things there! It looks like a wonderful store. Can't wait to spend some time browsing! crossing my fingers! such a great store! such a timely giveaway (2 birthdays + 2 major holidays; there is much gift giving/making around here this time of year) from such a fabulous shop! thanks! So who wouldn't want to win a gift certificate to this store? What a generous thing to do. Thank you for sharing this site - love it! Great store! Our kids have used the colored pencils and eco-dough... LOVE that it smells like rosemary. They have some lovely things; thank you to you and the shop for the gift certificate opportunity. Love your blog and shop!! Thank you! So many choices! Thanks for the chance! Wow, SO many Christmas gift ideas here, thanks for exposing us to this store! How wonderful! Thanks so much. what a great shop and generous giveaway! Ooooooo...how exciting!!! Count me in please. Now going to check out their goodies. Thank you! So much to love in that shop! Looks great, thanks for the giveaway. can't wait to take a look...thanks for the chance! Wow I just checked out their store - FABULOUS !! Love it, love it, LOVE it !!! What an amazing store. I see soooo many things I would love to have. this is such a great contest! my birthday is coming! this could be so great! thanks. Very nice! Thanks for the giveaway! What a wonderful gift! I'm so happy for a chance to win- thanks for the link to this great shop Maya! Oh fun! I'd love a chance to do some 'green' holiday shopping. Thank you for the opportunity! Awesome give away, I'm ordering a gift for my son for Christmas, even if I don't get the certificate, the % off is great! love love love this shop! dying for one of their mod tunic dresses! what a beautiful store and a beautiful gift!! That is such a generous offer! YES please. Lovely giveaway. Whoever wins is lucky. What a nice giveaway! Thanks!! I newly discovered your blog. Promptly I borrowed your newspaper bunting idea to decorate my son's nature themed birthday party. The look was just perfect! I wish I could show you the pictures, since you would be proud... Your blog is amazing! oh what a treat indeed it would be to win this! Oh how I would adore this! would love this generous card to do some holiday shopping! thanks for this and for all you do to inspire us, Maya! I just found your blog and LOVE it, am going to explore more of it. I would love the gift card, a nice treat for the holiday. What a generous giveaway; thanks for the introduction to this shop. I love that shawl! VERY cool store! I too am off to browse. :) Thanks for yet another great business to frequent, and for the chance to win. You rock, MayaMade! Very nice shop, did not know them. Thanks for this giveaway. I have checked out the site and it is amazing. Such a cool giveaway! Wonderful shop, I like their items specially the soaps. what a nice shop, thanks for the head's up! Lovely! Just in time for holiday gifts. Wow, such a lovely giveaway. My fingers are crossed! Wow! What a great giveaway, thank you for putting it together! What an exciting giveaway! Thank you! WOW! What an AMAZING GIVEAWAY! GREAT SHOP! I just LOVE this idea! Green, organic and handmade - AWESOME!!! I just browsed the shop and it looks beautiful. I would love to win a gift certificate. Thanks for the chance! I would love a chance to win a gift certificate to this store. Thanks!! What a fabulous shop! Thanks for a great giveaway! You're right, they do have a nice variety of lovely lovely things! What a terrific store! I love the candles, recycled glass dishes and the vintage love birds sign. I've been wanting reusesable produce bags for the longest time! I just popped over there, and everything is lovely. The children's toys and the home accessories (I need new pillows!) both caught my eye. How generous of your sponsors. I really loved the astronaut toy set "Zoom to the Moon". Thank you for this generous giveaway! Wahoo!!! What a great giveaway! Got some great shopping ideas from this site. Thanks. I would love to win a gift certificate! For me, this is the perfect treasure at the end of the green rainbow! Looks like a lovely shop! Thanks for the giveaway! Wow, they have some amazing products! Thanks for the giveaway! I've been enjoying maya*made so much! thank you for offering this giveaway! I would love one of these gift cards! What a fabulous shop. Just in time for my own "handmade holidays!" Thank you! Oh my! Hoe beautiful. Thanks for the chance. home mama of two (at) hotmail (dot) com. This looks like a wonderful shop! Thank you both for the generous giveaway. love handmade, organic, green. Great combination, and a wonderful give away! THANKS for the giveaway. Nice to find you and check out your turf. Wow! Id loooove try their soaps! This is an amazing giveaway! It's so nice of Green Rainbow and you to offer this little giveaway. Their store is lovely, as is your blog. green rainbow has so many cool things! thanks for the giveaway. What great timing, just as I am looking to green my holiday shopping! wow! and just in time for the holidays! (like I need an excuse). What a generous giveaway and such a lovely shop. Thank you so very much for the chance. Amazing shop and very generous give-away! Love their tops and accessories... could see some fun Christmas gifts from here! This is such a cool shop!! oooo! i'd love to win! how cool. I LOVE this shop! The wrap is gorgeous. I love that wrap in the picture! It looks like a great store. Wow! Couldn't choose my favorites among all those wonderful things! How generous! I would LOVE this! This is SUCH an amazing shop! Thanks for the introduction!!! I love the apparel!!! Oh yum! This place is great! Thank you so much for sharing it. Wouldn't I love to win this!!! Please toss my name in the hat!